McClure's shuffleboard table playing surfaces are made with pride in America and handcrafted in our Grand Rapids, Michigan facility. Every playing surface is made with hand-selected, premium-grade cuts of locally sourced Michigan hard maple. We hand-select each plank of wood and glue them up in our state of the art 18-foot press, the largest press known to make shuffleboard tops in the industry. 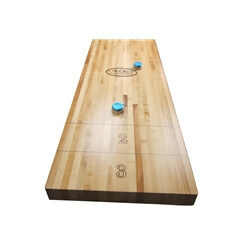 Finished with a durable varnish with a lifetime warranty, McClure’s shuffleboard playing surfaces are sure to withstand decades of exciting gameplay.